The Lady: A Homage to Sandy Denny, a special tour commemorating Sandy’s songwriting legacy is announced today. In the years since her death, Sandy has emerged as one of the UK ‘s greatest singer-songwriters. Her classic song ‘Who Knows Where the Time Goes’ has been recorded by a diverse range of artists including Cat Power, Nina Simone and Judy Collins. This special tour celebrates her legacy for a new generation and showcases for the first time her entire songbook taking in her work with Fairport Convention, Fotheringay, her solo career and the new songs completed by Thea Gilmore on her acclaimed album ‘Don’t Stop Singing’. Thea will join a unique line up of artists including former colleagues and friends Dave Swarbrick, Maddy Prior, and Jerry Donahue, alongside Joan Wasser (aka Joan As Police Woman), Green Gartside, PP Arnold and young admirers including Lavinia Blackwall (Trembling Bells), Sam Carter, Blair Dunlop (The Albion Band), Ben Nicholls, and other guests. Together with members of Bellowhead, who form the core of a house ‘super group’, they create this unique, adventurous homage to the artist described by Richard Thompson as ‘the greatest British female artist of her generation’. Andrew Batt, who has been involved in recent releases of Sandy’s material was creative producer of an earlier London staging of this concert to commemorate the 30th anniversary of Sandy’s death. Andrew then approached The Sage Gateshead about another staging as part of a tour, this time expanded to include Thea Gilmore’s songs. As a Music Beyond Mainstream venue, The Sage Gateshead introduced the idea to the MBM network. 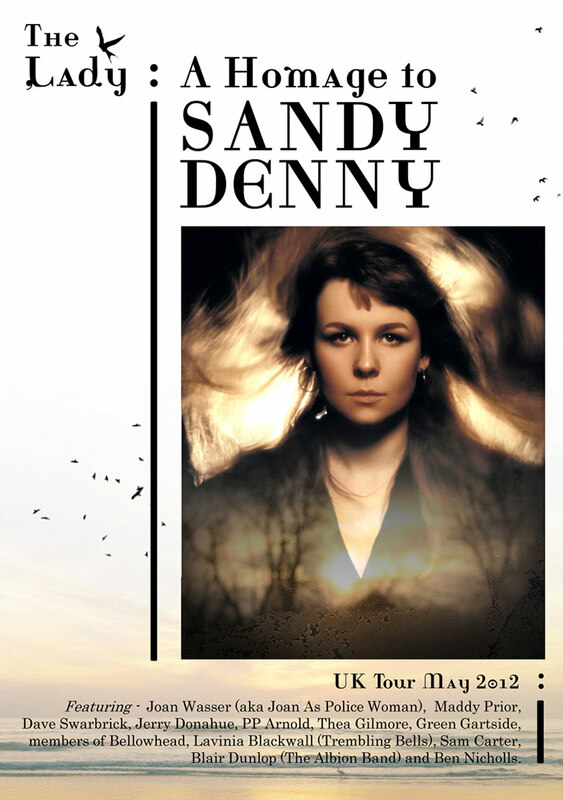 MBM felt the time was right to produce a live UK tour celebrating Sandy’s contribution for audiences “in the know”, who are familiar with her music but who would be introduced to new material set in the context of her entire musical legacy, and for new audiences who have heard contemporary popular artists name checked against her or be likened to her.